1. 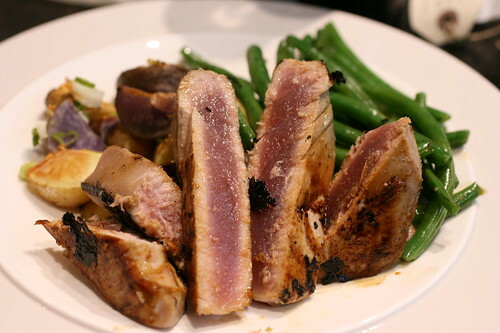 Place tuna steaks in a container that is large enough for them not to overlap, but too much space is not good either. 2. Mix together grapefruit vinegar, olive oil, ginger, garlic. and pour over tuna steaks. Refrigerate for two hours, turning over once. 3. Heat a small non-stick pan, sprayed with non-stick, over high heat. Season tuna steaks and sear for 2 minutes on each side. 2. Toss potatoes with 1 teaspoon olive oil and garlic. Season generously. Roast in the oven on a aluminum covered sheet pan for about 15 minutes. Turn potatoes, sprinkle scallions and the other teaspoon of olive oil. Bake for another 15 minutes. Potatoes are ready when fork tender. Heat a small wok (or saute pan if you don’t have a wok) with oil on high heat. Stir fry string beans for a few seconds. Add oyster sauce and continue to stir-fry. When you cannot see any more oil in the pan, add the water. (Be careful as the hot steam comes up.) Stir around a bit more and string beans should be done. posted by jessica	at 07:03 PM	Filed under Recipes. You can follow any responses to this entry through the RSS 2.0 feed. Both comments and pings are currently closed. I now marinate everything in ziploc freezer bags with all the air out so I don’t have to flip and I can use less marinade. I think it works pretty well. Bill, great way to do it. I’m using Tupperware because I’m trying to avoid throwing out extra plastic if I can. Thanks Dr. Food, I didn’t know that ziploc bags were dishwasher safe. This looks really good. I am a huge fan of the yellow fin tuna nicoise salad at the Modern (Bar room), it is impeccable and delicious. But I like your take on it. what an awesome meal. frankly, i’d pay big bucks for something presented like that–nicely done! Thanks Grace! If only I was getting paid the big bucks. Manger la Ville, you seem to be such a fan of the modern, now I’m dying to go.